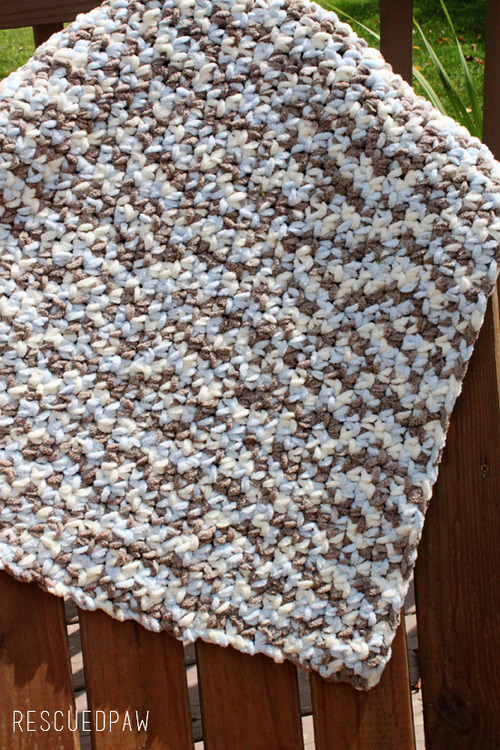 Looking for a free & easy crochet baby blanket pattern? I can help! I knew when I saw this Bernat Baby Blanket Yarn it was going to be perfect for a crocheted baby blanket! 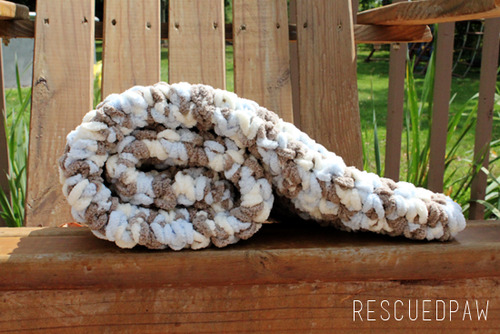 Read on down to learn how to make your very own baby blanket! 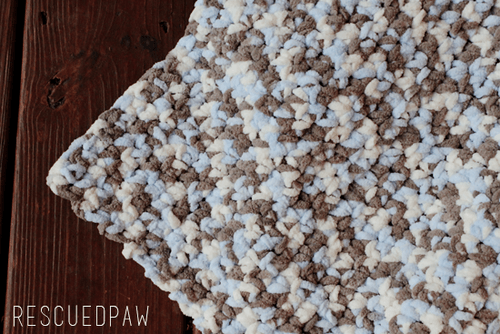 This crochet blanket pattern is extremely simple and works up super fast! Mainly because of the great simple crochet stitches it uses which means it’s a great beginner – friendly project! Read down to find the free crochet pattern get started! This crochet baby blanket Uses Just Single Crochets! When working with chunky yarn I found that single crochet stitches are the best to use. A bigger crochet stitch could leave holes in the blanket that little fingers could slip through and not be as warm. Plus single crochets are super easy to crochet up! I think the best chunk yarn to use for baby blanket is definitely Bernat blanket yarn! This baby yarn is one of the softest yarns you can use and I highly recommend it for a baby blanket – knit or crochet! It is extremely soft and perfect for a newborns sensitive skin. Check out the Bernat Baby Blanket Yarn below! I chose to use the color Little Cosmos (see the color above) in the Bernat Baby Blanket line because of the mixture of blues, browns and creams. If you prefer a different color Yarnspirations the parent company of Bernat has many beautiful colors to choose from. You won’t be disappointed! Read on down for the FULL, free crochet baby blanket pattern! WANT TO CHANGE THE Baby Blanket SIZE? LET’s Start Crocheting this baby blanket! Ready to get started on this beginner friendly blanket? Read on down to find the full crochet baby blanket pattern below or save to Pinterest to make later! Bernat Baby Blanket Yarn in Little Cosmos (Approximately 258 Yards) or any Bulky Yarn (6 weight). Foundation Row: Chain 48. In Second Chain from Hook Single Crochet, Single Crochet in every chain across, Turn. Row 1: Chain 1, Single Crochet in Second Chain from hook. Single Crochet in every Chain across, Turn. Row 2: Chain 1, Single Crochet into first stitch, Single Crochet into every Stitch across, Turn. Row 3-35: Repeat Row 2. Finishing: Fasten off yarn after Row 35 and weave in loose ends with a yarn needle. That’s it! I hope you enjoyed this free baby blanket pattern! Are you looking for me free crochet baby blanket patterns? Then you may also like the Charlotte Crochet Blanket or the Baby Ripple Blanket patterns too! Follow me on Social Media for Even more free patterns! I cannot print off as this one. You can copy and paste into wordpad or notepad to print. 1) when you say SC in 2nd chain from the hook, do you mean the chain immediately beside the chain the hook is in… Or 2 chains away from the chain the hook is in? 2) why do the foundation row and row 1 require this 2nd chain from the hook instruction when all other rows can simply SC in each chain? 1. You will sc in the ch that is 2 chains away. 2. All the other rows you are single crocheting in each stitch not the chain 1 at the beginning of each row. I agree larger stitches leaves big unsafe gaps when using this yarn. I have made several baby afghans using this product. I’ve found using 8mm crochet hook and hdc throughout make a lovely blanket. Then you can use single crochet for borders. I have gotten many compliments about my afghans. This was my first time making this patterns and it’s excellent! I used the Bernat Little Denim. Thanks for the freebie! How do I add a new ball of Bernat Baby Yarn to the baby blanket? I would like to make this a little bigger can I add to the foundation chains and should it be a certain number of chains? Krista, I am just learning to crochet. If I start with a chain of 48 will I have 47 stitches per row plus the chain one turning stitch counting as the 48th stitch? I keep trying to start this and that’s how I keep ending up. Thanks!! Awesome pattern. Very simple. Thanks so very much for sharing. I click “tried it” on Pinterest and uploaded a picture. You make it a bit more girly for a newborn daughter, I added a traditional scalloped edging. Thanks Carol! I’ll be sure to look for it on there! The scalloped edging sounds beautiful! How do you do the traditional scalloped edging? Do you mix skeins of yarn and carry them up the sides? I have made a couple blankets with the Bernat Baby blanket yarn and it seems with the yarns that have more than 3 colors it is very obvious where the skeins change. Thanks! I don’t usually count my chain 1’s as stitches so I would count each row as 47. 🙂 Happy Crocheting! You can start with any beginning # and work up the blanket as written. Happy Crocheting! How many chains do i need to do to make it bigger . How many balls of yarn did you use? Thank you! Thank you!! Thank you!!! I want to make my niece a baby afghan for her baby shower gift. Since last week I can’t tell you the number of different afghans I’ve started and ripped out trying to follow instruction videos on You Tube. They were supposed to be simple. Not so. This is the first time I am working with Bernat Blanket yarn which is also challenging. Then, this morning I found your’s. Now I am on my way to completing my gift. The “N” hook and single crochet throughout is so easy. I am making this in the Vintage White color. P.S. This is the first time I am crocheting again after nearly 50 years. I’m 70! That is so amazing! Thank you so much for writing to me! I am so happy that this pattern works for you and that it is the first time you are crocheting in 50 years. Happy Crocheting! This takes more like 6-7 balls of yarn but I still love it. What calculation do i do to convert a baby blanket like this to a twin blanket? I don’t want to under buy or over buy skeins.